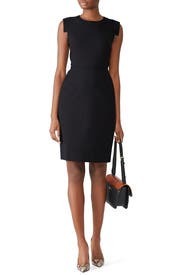 Crisp cap sleeves further the polished look of this J.Crew sheath dress that really suits you. Complete the look with Gigi New York's Abigail Crossbody. Black wool (96% Wool, 4% Elastane). Sheath. Sleeveless. Crew neckline. Hidden back zipper closure. 39.5" from shoulder to hemline. Imported. The dress runs large. It hit me right at the knee. Since it was long and too big, I returned it without wearing. If the fit were better, the length would've been fine. It was just too big overall. 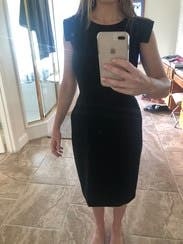 Wore this dress for a funeral but this is definitely a staple piece. It's appropriate for work, wedding, event, or anything else you can think of. Dress is very flattering and comfortable. It has pockets!!! I am typically a 2 in most sizes and I was sent a size 0 and it fit perfect. 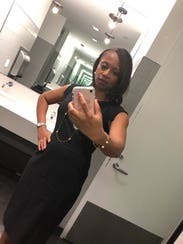 The cut and shape worked well with my pear shaped body and is very suitable for work or even a nice dinner out. Quality isn't Jcrews finest however. This dress is a keeper. The square shoulder detail and the high pockets are very flattering. I added heels and sparkles for the adult party and booties for the party that included chasing kids. The stretch is body shaping and flattering. Nothing too special. There is no stretch in the material so I would maybe size up. I normally wear a 10-12 and wore a 12 is this dress. Felt very professional. I am usually between a 10-12 and decided to get a 12 here just to be safe. It was a little looser than I would normally wear for a dress but I still wore it. I will try a size 10 next time. It's pretty long, I'm 5'4 and it went past my knees so I had to wear heels with it to avoid looking frumpy. The shoulders give it a subtle but cute twist for the office. I realize still more baby weight to shed. Great fit. Will rent again in size 6. Nice fabric. The top fit a little snug. I like the pockets and they laid flat against the dress. Wrinkled easily and the shape of the armholes are not the most flattering. Cut of the dress is PERFECT! Love this dress. Wore this on my first day back to work from maternity leave. Perfect fit. Not too snug on the waist. Fit was very comfortable. Only negative is the armpit area- it kinda gaps in the front or back because of the over the shoulder Fabric. I loved this dress! And it has pockets! So cute! This dress runs a bit large so I would size down if in between sizes. 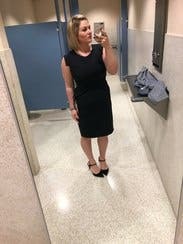 Ran a little large for me, but made the dress comfortable for a long work day. Hit just above knee on me (I'm 5'8) and was snug around my chest, but flattering. 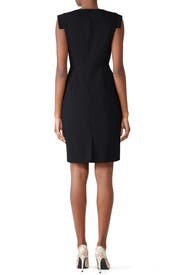 Great wardrobe staple, and as my bf says "Looks like a nice version of all the other black dresses you own for work!" (You can't fault him, he's not wrong) If I were to rent again, I would likely size down. True to size, so don't size up. I'm a size 16 (14W), but ordered an 18, as J.Crew tends to run very narrow. This dress is sized generously and I could have ordered my actual size. Perfect length (5'6") and flattering cut. I'm going to order this from J.Crew in my actual size. Runs small but very nice dress! I got the 6 and it fits tight around the middle but not so bad to return. If I rent again I would definitely get the 8. I'm going to wear this to work and an interview. 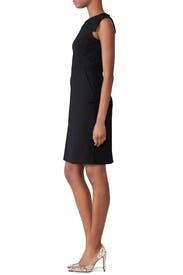 Great looking everyday work dress for a more formal work environment. Nice tuck at the waist, fell nicely even after a full day of meetings. This dress fit me perfectly! 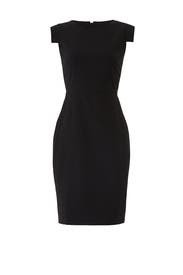 Great for an hourglass figure, it has room for hips and shows off your waist without being too tight or restricting. I love this dress because it is a great length, and does not ride up when I sit at my desk. The sleeves are so cute, too! Considering buying, but at least will keep for multiple wears! I had been eyeing this dress on J.Crew for a while. This type of sheath is normally very flattering for me. However, it was pretty shapeless on me. If I owned it I would have to tailor it before wearing. Would be great in a different color as well. Very nice dress. Felt very comfortable throughout the day. Great staple for one's closet. Very classic dress with nice accents. Very true to size and fit very well on me. The pockets are a nice touch even if not really functional. I wore this twice before sending back. I would definitely consider buying it.